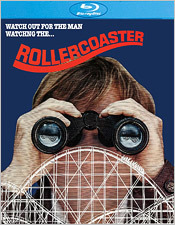 Released in the summer of 1977, Rollercoaster was billed as a so-called “disaster movie” and was directed by James Goldstone, who also directed Swashbuckler for Universal one year prior. The movie concerns a mad bomber (Timothy Bottoms) who begins a destructive terroristic campaign by destroying rollercoaster rides in different theme parks. Once he has the attention of the police, he instructs them to hand over to him one million dollars or he will destroy more, killing the people on them. A ride inspector (George Segal) is selected to deliver the money by F.B.I. agent Hoyt (Richard Widmark), but under both the watchful eyes of the bomber himself and the police in hopes of catching him. When I was a young teenager and wrote many short stories and scripts, I came up with the idea after seeing Speed of doing the same kind of movie but set in King’s Island, which wasn’t far from where I lived at the time. I even had some action set pieces laid out in my mind, including an attempt to remove a bomb from a rollercoaster while it was still in motion. It wasn’t until years later when I discovered Rollercoaster that I realized that somebody had already had a similar idea, so I kind of swept my idea to the side. Looking at it today, the movie certainly doesn’t have the action-oriented feel that I had in mind for my version. Instead, it mostly plays on the suspense of what could happen, as opposed to what actually does happen. Shot on location at several different theme parks across the country, it’s a fairly straightforward and tight little thriller with an eclectic cast, including three early appearances by Helen Hunt, Steve Guttenberg, and Craig Wasson. It was also a film that was more graphic during early editorial on it. Much of the blood was trimmed to achieve a lower rating, including the carnage that occurs during one of the last scenes in the film, which I won’t spoil. It was released during a time when disaster movies were all the rage and were being made about every conceivable piece of subject matter. Rollercoaster certainly doesn’t follow the direct formula of those movies, meaning a group of various characters coming together to overcome an epic-scale disaster, but it certainly was marketed that way. It even featured Sensurround, if you were lucky enough to go to a cinema that came equipped with it. The concept of a surround soundtrack itself became something of a staple for Hollywood movies for years to come, as well as the home theater systems of today, but Sensurround was an early prelude to that. Even though the movie was released the same summer as Star Wars, it still managed to bring in decent business, even if the reviews weren’t that positive. For me, I see it as a blueprint for a movie I wanted to make, and it actually succeeds with good suspense and decent performances. For a movie that isn’t chockablock full of amazing sequences, as well as being incredibly dated, it still has plenty to offer and is worth watching more than once. It’s also notable that the movie was scored by Lalo Schifrin, who most will recognize as the composer for the Mission: Impossible theme, the Dirty Harry series, the original Amityville Horror, and many others. Shout! Factory’s Blu-ray presentation of Rollercoaster features a surprisingly sharp and organic transfer with a very pleasant grain structure and a nice amount of fine detail on display. Colors are fairly accurate, if not a bit flat, and skin tones tend to lean more towards orange and reddish hues. Blacks are uneven, sometimes deep and sometimes lightened by the grain. Contrast and brightness levels are satisfactory however, and there are no signs of digital enhancement on display. There are a few minor film artifacts left behind, such as scratches and a bit of dirt, as well as a bit of mild flicker. The audio options include two tracks: the English 2.1 Dolby True HD Sensurround track (which displays as 3.1 on sound systems) and the English 2.0 DTS-HD track. The Sensurround track isn’t quite as fulfilling as the 2.0 track, but it does add a bit of bass, but it’s not nearly as promising as one might’ve hoped for. Dialogue and sound effects are clear on both tracks, but the score is mixed in a little better and sounds more natural on the 2.0 track. It’s a very pleasing transfer, overall. There are also subtitles in English SDH for those who need them, as well as a few extras, including Roller Coaster: An Interview with Writer Tommy Cook, 4 radio spots, a still gallery, and the original theatrical trailer. Rollercoaster is a B movie by nature, but it has a terrific little cast and some genuine tension woven into it. It’s a little rough around the edges, but it’s much better than it has any right to be. Shout! Factory’s Blu-ray release of the movie will likely give it a bit more life than it has had in a long time, which isn’t a bad thing. It’s an enjoyable movie, and one that I wish I had made.